Small-town fry cook Odd Thomas (Anton Yelchin) is an ordinary guy with a paranormal secret: he sees dead people, everywhere. When a creepy stranger shows-up with an entourage of ghostly bodachs - predators who feed on pain and portend mass destruction - Odd knows that his town is in serious trouble. LOS ANGELES, March 6, 2014 - Image Entertainment, an RLJ Entertainment (NASDAQ: RLJE) brand, announces the DVD and Blu-ray/DVD combo release of Odd Thomas . The action/adventure film, based on the best-selling novel by Dean Koontz, was written and directed by Stephen Sommers (The Mummy, G.I. Joe: Rise of the Cobra) and stars Anton Yelchin (Star Trek, Fright Night), Willem Dafoe (Spider-Man, The Hunter) and Addison Timlin (Stand Up Guys, That Awkward Moment). 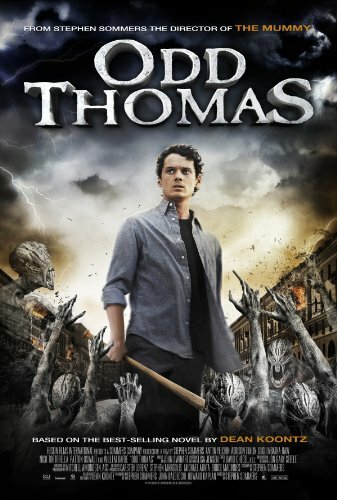 Odd Thomas will be available on DVD for a SRP of $29.96 and Blu-ray/DVD combo for a SRP of $34.97. Small-town fry cook Odd Thomas (Anton Yelchin) is an ordinary guy with a paranormal secret: he sees dead people, everywhere. When a creepy stranger shows-up with an entourage of ghostly bodachs - predators who feed on pain and portend mass destruction - Odd knows that his town is in serious trouble. Teaming up with his sweetheart Stormy (Addison Timlin) and the local sheriff (Willem Dafoe), Odd plunges into an epic battle of good vs evil to try to stop a disaster of apocalyptic proportions. Based on the best-selling thriller by Dean Koontz, Odd Thomas is a supernatural action thrill-ride from the acclaimed director of The Mummy and G.I. Joe: Rise of the Cobra.